The Town of Smithfield is pleased to announce that Smithfield Town Council meeting videos will now be posted online. The meetings will be posted on the Town’s Vimeo account at vimeopro.com/smithfieldri/meetings. 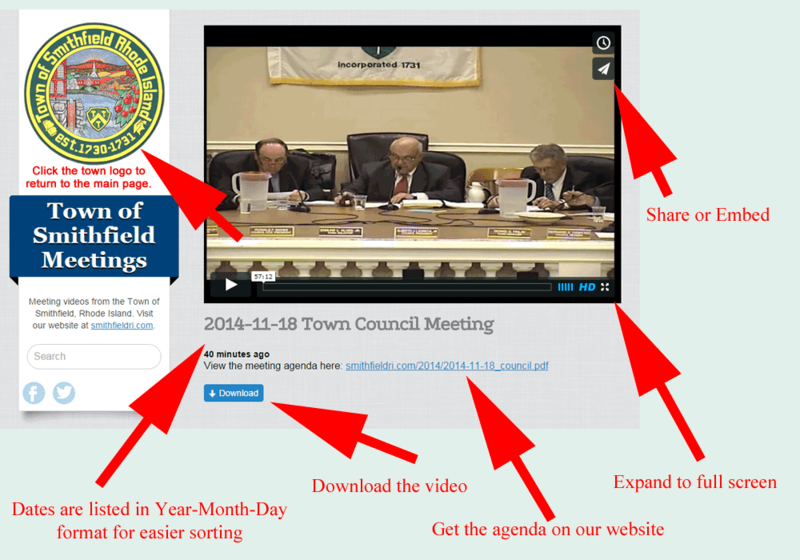 Videos will also be linked to individual meeting dates on the meeting agendas page on the town website, smithfieldri.com. For 2016, that page link is smithfieldri.com/2016-meeting-agendas/. UPDATE: As of 7-1-2016, Planning Board & Zoning Board meeting videos are now posted online as well. Meeting videos will be posted online as soon as possible after the meeting ends, typically within a day or two. Users can view the meetings directly online or choose to download them directly in a variety of formats suitable for different devices.